Looking to the recent weather forecasts I got the perception that the autumn is leaving behind, giving space to the coming winter. Below average temperatures, north winds and the first snow that appeared by the end of October were indicative of this change. The fall season was wet enough with considerable amounts of moisture and precipitation, and the transition from summer to fall seemed to be more “normal” than last year. But taking into account last year’s lesson, by living through one of the driest winters during the last decade or so, and no matter what the weather forecasts and climate predictions claim, I am a bit more hesitant to welcome the winter yet. In any case, no matter what the Gods of climate will do, we have concluded the 2016 summer-fall season and refuge Christos Kakkalos has closed down. Leaving nature to do its own thing. 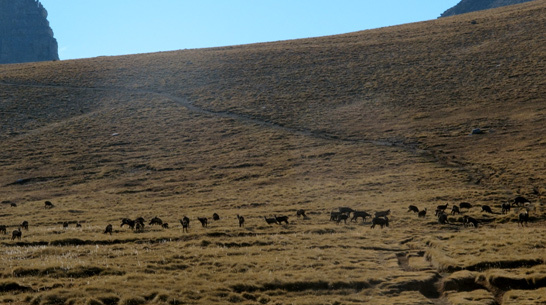 The Balkan chamois outnumbering humans and enjoying the well-deserved solitude of the Muses Plateau (M. Styllas). The best thing to do is to leave the place to a long-desired rest and the local residents - the Balkan chamois who become alarmingly friendly, to enjoy the place for themselves. We expect to re-open the refuge in late January, greatly hoping to encounter full winter conditions. Until our next rendez-vous with the Gods, which will take place in January 21st, I wish to you all a relaxing and creative time.